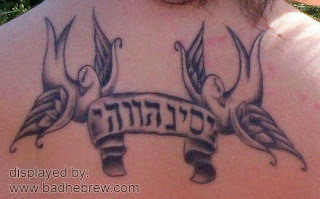 Bad Hebrew Tattoos: There's a Banner, but where's the God? There's a Banner, but where's the God? The girl was going for a Hebrew tattoo saying "The Lord is my Banner". It all went downhill from there. See, the tattoo ended up backwards. But not only that, God's most sacred name, YHWH, is also misspelled. It somehow acquired an extra letter. Bad karma? I think so! Tattoo it at your own risk! The extra letters can be attributed to using full script instead of short script. Non-existent in biblical Hebrew, full script is very common in modern Hebrew. It is used everywhere except poems and children's books. So the tatoo, though sacrilegious and backwords, is otherwise correct full-script Hebrew of a phrase originally written in short script. The rule for full script is, for O, U or W sounds, you're allowed to add a 'ו'. If there is none, for a W sound, you can add two Vavs to denote the diphthong. If there's a I or E sound, you're allowed to add a 'י'. Again, to denote the diphthong that accompanies the Y consonant, you're allowed to use a double Yod.And if there is a A sound, you're allowed to add a 'א'. no double Alephs. mux, I'm quite sure you don't understand the rules of ktiv maleh vs. ktiv haser properly. it doesn't mean you can just add "Ehevi" letters everywhere instead of nikud. the word here is נס and it's pronounced Ness. if it's my ness then it's נסי and it can't be spelled ניסי even if that's how you'd pronounce it as there is no such word as ניס. This is true for regular Hebrew words, but YHWH isn't a word, but a name. Names have their fixed spellings, and you don't go and add letters to them. It's like saying that Dawn and Don are the same name, just because they sound the same. The problem which no one addresses is that we expect speakers of English or othe normal languages to accept that in the 21st century, Israelis bravely try to make-do with a gutted-out carcass of a spelling system, with no vowels appearing much of anywhere, where The Space Girls are The Spice Girls (double yods, both), where a Dane can deign to dine with a Dawn or a Don and nobody knows or cares. Typo, you are of course very correct that a proper Hebrew name has acquired a fixed spelling and need's respected. But in a language where a shop I passed daily in Yafo was either 'Center Parts' or 'Senator Farts', we certainly have some of our own homework to do, especially if we insist on stealing foreign words in every sentence. There, now I'm not mad any more, ha. Yoni, I understand your rant about Hebrew being a funnily spelled language, but I still think it's not half as horrible as the language in which we're writing here with. I'd never use English as an example of language that has a spelling system which makes any sense, if I were you. Reut, I'd love to have you spend some fun time perusing my site: you will soon see that I agree on the horrific and inconsistent nature of english, and spend many waking hours charting its foibles and odd 'fish'. I dearly love this site, and see my role here as a balanced identifier of 'areas ripe for improvement' in both languages. I do stand by my dislike of The Space Girls, possibly because I needed a conference with my younger son in order to discover I had them all wrong, ha. I've spent 16 years refusing to allow even strangers to pock-mark a hebrew sentence with misguided la'u'zit (foreign 'loan' words) when there are perfectly wonderful native words full of primal and biblical power and relevance for the same concept. My point on one leg: Kinda forgive the victim tatooees for they know not what they do, but then, we're not the easiest gang to figure out. Shabbat shalom!